Our first event of the year will certainly fulfill your blackest and deepest desires. Already long line of artist that we presented you will be continued. On February 15th atDrugstore Beogradour guests will be long waitedVSKand upcoming techno organizationLevel Deltaresidents, Tom Talenberg and Corium. 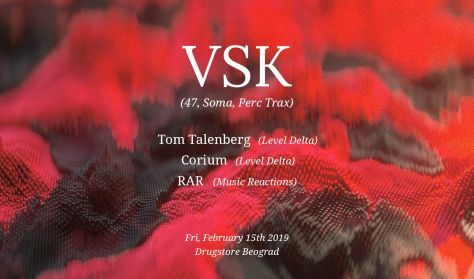 VSK(47,Soma Records, Perc Trax) - Italian techno producer and DJ, born in Rome in 1986 by the name of Francesco Visconti. He has got familiar to different forms of techno, his style ranging from a sound usually very hard and dark, often with industrial influences, to a very different one, deeper and more mental, both still easily recognizable as coming from the same mind. He's releasing tracks on his own labelCRS ltd, and on many more other labels like:47,Soma Records, Perc Trax,Planet Rhythm, Sontag Morgen,EarToGround, etc. Tom Talenberg(Level Delta) - together with Heather Stedman he's Level Delta music project's co-founder and owner. Tom's style reflects his love for minimalism, groove and clarity. Using bleepy modular sounds to deep chords, he keeps it dynamic and flowing. Corium(Level Delta) - freshest addition to LD family, known for impulsive and atmospheric Techno, influenced by Industrial, EBM and pumping 90’s sounds. By cutting styles and his versatility, he likes to surprise as well as create new vibes. Berlin will be in Drugstore Beograd on February 15th, knowing all artists are Berlin based. Prepare yourself, it's time toREACT!